Successfully target hogs, coyotes, fox, bobcat, raccoons and varmints with the Wicked Lights W403-IC Hog and Predator Hunting Scan Light. l New for 2015, The W403's Full Intensity Control Tail Cap out classes the competition with true full-range control of light intensity coupled with selectable "ON/OFF" to any light intensity level the user desires - An industry first-in-class ability! In lieu of using a poorly performing analog circuit design for dimming and intensity control like some competitors use, Wicked Lights uses advanced pulse-width modulation (PWM) technology which provides for a much smoother and wider ranging light intensity adjustment ability and eliminates skewing of LED color which plagues analog designs. The mechanical tail cap design coupled with PWM circuit allows the user to adjust the light intensity to their exact intensity preference based on ambient light, distance to target animal, and animals reaction to the light (if any). Desirability of this design is easily realized when over a feeder or bait station and having the ability to pre-set the light intensity to the exact intensity for the distance - Not to bright, not to dim, just right, and then turn it "ON" to the exact intensity when needed. The PWM advantage is also easily demonstrated while scanning and having the ability to quickly adjust light intensity up or down based on the animals reactions. 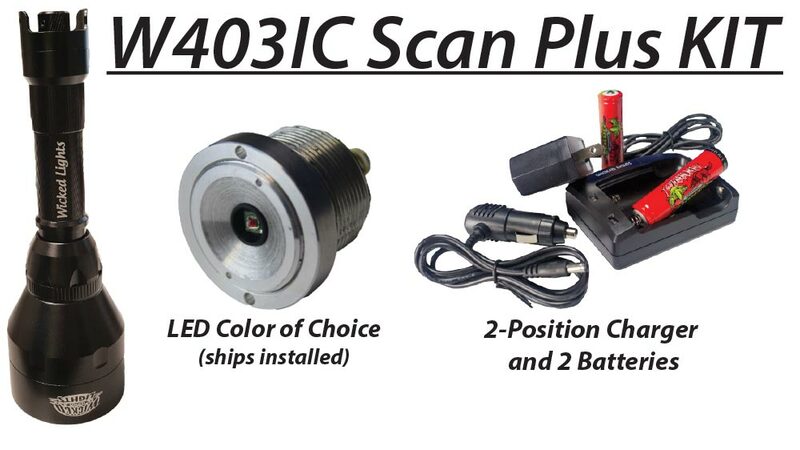 The W403IC comes in your choice of Green, Red, or White LED. The LED assembly features a 3-year warranty. The W403IC LED assembly is produced by an ISO9001 certified LED manufacturer for consistent color, reliability, and manufacturing quality. Manufacturer specifications are subject to change without notice.